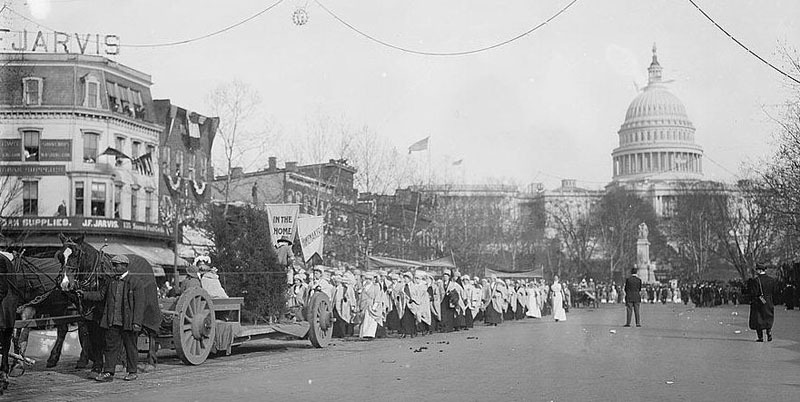 “The Woman Suffragist Parade of 1913,” Histories of the National Mall, accessed April 23, 2019, http://mallhistory.org/items/show/155. Over 5,000 marchers, mostly women, came to Washington, DC, from around the country to participate in the Woman Suffrage Parade of 1913. They marched down Pennsylvania Avenue from near the Capital to the Treasury Building. The mostly male crowd lining the street was hostile to the women and their aim of enfranchisement. Marchers were jeered, shoved, and tripped with police doing little to help. Eventually troops from nearby Fort Myer had to be called in for crowd control. Despite setbacks some were able to make it to the grandstand at the Treasury Building to speak. The parade and the crowd’s reaction reinvigorated support for the suffragists.